It is not uncommon for various voices in our contemporary culture to denigrate the quality of our nation’s younger generation. Consider that wonderful line in the lyrics of “Bye Bye Birdie”: “What’s the matter with kids today?” I may have an answer for you. Could it be that many of them are far more educated, more sophisticated, and more talented than we were at their age? Certainly it seemed that way to me at the Nancy Bock Center for the Performing Arts as I looked on in utter astonishment during the opening night performance of Class Act’s “Les Misérables.” Although subtitled “Student Edition” to conform to the rigid licensing requirements of the original producer, Cameron Mackintosh, this was every inch a full and masterful production of the show, under the brilliant direction of Class Act founder, Keith Brumfield (Assistant Director, Tina Kraft). I have had the pleasure of being essentially the critic-of-record for nearly a decade of wonderful Class Act Productions, but I have never seen anything in youth theatre to equal this stunning production. The show, written by Alain Boublil and Claude-Michel Schonberg, is based on Victor Hugo’s classic 1862 novel of the same name, and features Schonberg’s beautiful music (the superb orchestra here was conducted by Music Director, Rae Moses), and the rich lyrics of Herbert Kretzmer. The plot is so wide-ranging, it would have been helpful to the audience if a synopsis was included in the program booklet. It tells the redemptive story of the thief, Jean Valjean (a role sung here with mature power from gifted Chris Trapani), and his pursuer, police inspector Javert, portrayed in this production by talented Grady Randle. Along the way we meet a kindly bishop (Kent Doerries), a desperate mother named Fantine (velvet-voiced Meredith Tyler sings a haunting and mystical, “I Dreamed a Dream”). Next, we meet Fantine’s daughter, (Caroline Davis, as young Cosette, sings with purity in “Castle on a Cloud,” and golden-throated Jennifer Barnes plays the mature Cosette with a voice that reminded me of Jeanette MacDonald). Cosette’s abusive caretakers are the cruel innkeepers, the Thénardiers (hilariously played by Monica Bradley and Callen Myers, who steal the show singing “Master of the House”). Sweet Nicole Dunton, plays their daughter as the Young Eponine, with Kendra Sherman singing divinely as the mature Eponine, most notably in a superb “On My Own”. For a love triangle, Eponine is in love with student, Marius (a nice performance from Nick Davoli), but he is in love with Cosette. Meanwhile, Valjean has reformed and become both a factory owner and Mayor while fulfilling a deathbed promise to Fantine to care for her daughter Cosette. But trouble fills the air in France as rebellious students, led by Enjolras (Michael Hanna) prepare to revolt following the death of beloved General Lamarque, the only government leader considered a champion of the poor. Mr. Hanna is a young actor to watch, as the fierce intensity of his performance here was riveting, both vocally and theatrically. In leading the rebellion, he seemed to literally own the stage. The staging (Set Designer, Tom Curtright) was outstanding, especially in the remarkable and realistic battle scene with its rotating barricades, which must have called to mind the Alamo for the many Texans in the audience. 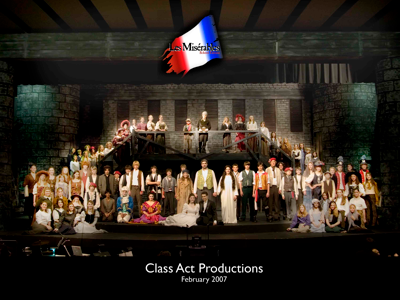 As the young street urchin, Gavroche, little Cole Thompson is another scene-stealer in this segment as he sings of “Little People.” The sole survivors of the battle, Valjean rescues the injured Marius, and by play’s end, Javert takes his own life, Marius marries Cosette, and Valjean’s own redemptive death has him reunited with the heavenly spirits of Fantine, Eponine, and all the rebels who died so valiantly. Increased Class Act emphasis on upgrading the sound system has paid off as well, with the exception of a few moments when powerful soloists were over-amplified. The lighting designs of Blake Minor were elegant. Costumes (Caroline Zirilli) and Makeup and Hair designs (Kirsten Berger) gave the staging the look of a classic painting in scene after scene, while the technical direction (Cathy O’Brien & Assistant Matt Arceneaux) kept this epic running smoothly. While I am unable to acknowledge individually the nearly 200 young members of the extraordinary cast, I must take this opportunity to speak directly to each and every youngster who participated in this really amazing production. With your outstanding singing, acting, and dancing (Choreographer, Fayla Curry), you have been part of something truly exceptional, and produced a work of art that will be long remembered by those of us lucky enough to have seen it. You may remember that Victor Hugo said, “Life’s greatest happiness is to be greatly loved.” I am sure I speak for many when I assure you that in this beautiful community of The Woodlands, Class Act is very greatly loved!